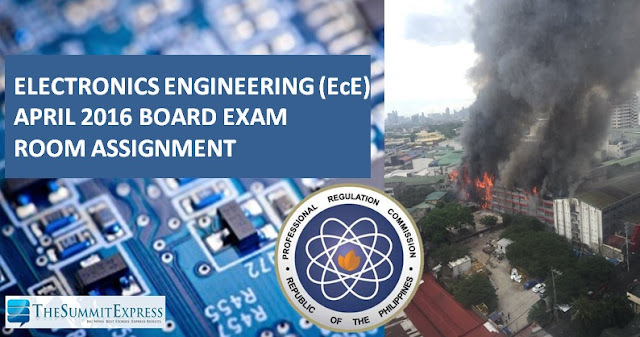 MANILA, Philippines - The Professional Regulation Commission (PRC) announced today the new examination venues for the April 3 and 4 Electronics Engineers (ECE) and April 5 Electronics Technicians (ECT) board exam for Manila examinees. There's no news of postponement of licensure exam contrary to some inquiries and reports due to huge fire that hit University of the East (UE) in Manila, the supposed venue of the board exam starting Sunday. The new examination venues include the Marychiles College, Central Colleges of the Philippines, College of the Holy Spirit, and the Southeast Asian College, Inc. The change of examination venue came after a fire hit the College of Arts and Sciences and the Engineering Buildings of the UE-Manila at around 9:30AM today. Updating for Electronics Technician (ECT) new room assignment. Examinees are advised to check their room and seat assignments HERE. The Electronics Engineers and Electronics Technicians licensure exam will be held simultaneously in Manila, Baguio, Cebu and Davao.